FEBRUARY 25, 2013 – Little Rock, Arkansas. The Stars of the Industry Awards Gala honors employees and managers in the hospitality industry that go above and beyond their job descriptions to make their coworkers and customers feel privileged to know them. Some of them are on the front line, and some are behind the scenes, but they all help to make the industry in Arkansas the best in the nation. They are why the hospitality industry is the second largest industry in the state that provides over 100,000 jobs and brings over $5.6 billion to the state. 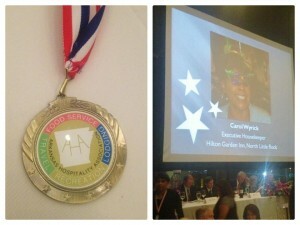 Hilton Garden Inn’s Carol Wyrick Executive Housekeeper was recognized for her outstanding performance in hospitality. Carol has been with the property since its opening in December 2009 and has been a wonderful team member for the Garden Inn.